In general, the hot water flow rate of a small tankless water heater can support a bathroom and a kitchen with a dishwasher. The key to selecting the proper model is knowing the flow rates of your fixtures, the coldest temperature of incoming water, and your usage patterns (how many faucets do you expect to be able to use at the same time?). Work with your plumber to choose a size that fits your needs. You can also install more than one heater to heat water by zone. For example, at my current remodel I’ve installed two tankless water heaters—one supports a kitchen, bathroom and half bath; the second supports two additional bathrooms. Understand your dishwasher and clothes washer. Your appliances may need hot water from your tankless heater or they may heat water internally. I bought a super-efficient Asko clothes washer/dryer that heats the water itself and requires only a cold water connection. I didn’t realize this until we installed the appliance! Be prepared for resistance from your contractor. Because of concerns about time and liability, most contractors don’t want to try something new. If you are convinced that a tankless water heater is for you, insist on it and find a contractor who will work with you (preferably one who has experience installing tankless units). Provide the contractor with the manufacturer’s installation instructions (often available online). You may also want to contact the manufacturer’s technical support department for advice on size and other considerations. Venting: For direct venting (through the wall), the vent termination must be at least three feet from any operable window. If you are venting through the roof, the length of the vent is determined by the size of the heater (the BTU output) and the number of elbows, or turns, in the vent. You may not be able to vent the heater through the roof if the vent run is long—for example, if the heater is in the basement of a three-story building. Combustion air: A gas-fired water heater (tankless or not) requires a source of oxygen for combustion. To avoid back-drafting that combustion air through another appliance's exhaust pipe, your water heater should be sealed-combustion direct-vent. Tankless water heaters can produce three to four times the BTUs a conventional heater produces. Your plumber must verify that your current gas line size, length and even gas meter can provide sufficient gas flow to the unit. Tankless heaters also require minimum water flows for activation; again, your plumber should verify that your supply meets the specifications. Avoid long runs between the heater and the faucet. Because tankless heaters generate hot water only when you turn on the hot water tap, it takes some time (a small delay) to heat cold water to the optimal temperature. Locating the heater far from the tap can result in a more noticeable "sandwich effect" when hot water is used intermittently. One way to overcome this problem is to use a recirculation pump that brings water from the farthest fixture in the plumbing run back to the tankless heater, but because these pumps use a lot of energy keeping water in the loop hot, it's better to preheat or buffer hot water. For details on preheating, read GreenHomeGuide's Get Optimal Performance from a Tankless Water Heater. Make sure you meet the building code. If anyone—you, your plumber or the building inspector—misses a detail during preliminary reviews, you’ll have a messy and costly fix to sort out later. Make sure the venting material complies with the manufacturer’s specifications and local building codes. I’ve found that the venting material for tankless water heaters is specific: it is made of stainless steel and has seals built into it to prevent carbon monoxide from leaking into the home. Double-walled material may be required, depending on your design (be prepared: it is expensive). 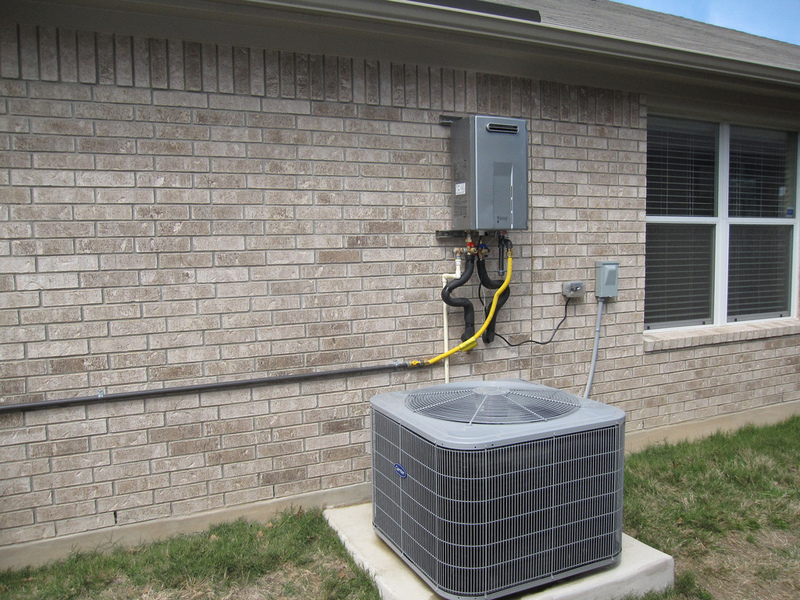 Your plumber or HVAC contractor may miss this specification. Be patient and prepare for building department reviews. In my experience, some building department staff members are up to speed on tankless heaters and some are not. There can be a disconnect between the plan review personnel at the building department and the on-site inspector for your project. Be prepared for hesitation and confusion on either end of the permit review and inspection process. Keep the installation specifications and the manufacturer’s tech support number on hand—they can make life easier for all involved in the project.